Compact crossovers are tailor-made for family adventures and the Toyota RAV4 is an icon in the segment that is even more impressive with the debut of the next-generation 2019 Toyota RAV4. 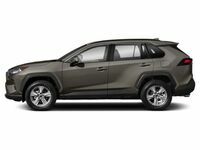 More athletic, more attractive and more advanced than its predecessor, the Toyota RAV4 promises to be a fan favorite at Downeast Toyota. Learn more about how the Toyota RAV4 stacks up against a premier competitor in this 2019 Toyota RAV4 vs 2019 Honda CR-V comparison. A complete redesign promises to make the 2019 Toyota RAV4 stand out from the automotive crowd and with five trim levels to choose from – LE, XLE, XLE Premium, Adventure and Limited – the Toyota compact crossover can be tailored to fit your lifestyle. With Toyota New Global Architecture as a foundation, the Toyota RAV4 is more athletic than ever with the style to match that features Multi-LED headlights, a bold hexagonal grille, additional ground clearance and a longer wheelbase. Value is an important asset for families in search of a brand-new crossover and the Toyota RAV4 comes out on top in this 2019 Toyota RAV4 vs 2019 Honda CR-V comparison. With a starting price that stands similar to its Honda competitor at $25,500, the Toyota RAV4 is an affordable option for Bangor-area families. With a long list of standard features that include Toyota Safety Sense™ 2.0 crash-prevention technology and a 7-inch Toyota Entune™ 3.0 touchscreen infotainment system with on-board Wi-Fi, the entry-level Toyota RAV4 LE trim provides incredible value. Base Honda CR-V LX trim levels are well equipped, but lack a touchscreen infotainment system and a full complement of active safety systems. A complete redesign includes a next-generation powertrain that promises unrivaled thrills and exemplary fuel economy that make the 2019 Toyota RAV4 stand out from competitors. A 203-horsepower Dynamic Force four-cylinder engine paired with a Direct-Shift eight-speed automatic transmission serves as the standard powertrain and will earn 26 mpg in the city and 35 mpg on the highway. Honda CR-V entries employ a 184-horsepower 2.4-liter four-cylinder engine that is married to a Continuously Variable Transmission to make 26 mpg in the city and 32 mpg on the highway. An available hybrid powertrain sets the Toyota RAV4 apart from the Honda CR-V and other competitors in the segment. Toyota RAV4 Hybrid editions are powered by a modified 2.5-liter four-cylinder gas engine that pairs with a high-torque electric motor to manufacture 219 horsepower that is distributed via a Continuously Variable Transmission. With this combination under the hood, the hybrid Toyota crossover will make 41 mpg in the city and 37 mpg on the highway – numbers that the Honda CR-V cannot match. When adventure calls, the next-generation Toyota RAV4 will answer. Dynamic Torque Vectoring AWD with Rear Driveline Disconnect is an innovative system that diverts 50 percent of torque to the rear wheels in all-wheel drive conditions and will disengage the rear driveline at highway speed to maximize fuel economy. With the addition of Multi-Terrain Select technology, you will have access to driver-selectable terrain modes that will augment performance. Visit Downeast Toyota today to see what the 2019 Toyota RAV4 can do firsthand!